Without a doubt, the Ultra HD (4K) broadcasting standard is the future of television. For now, though, 4K TVs have two major hurdles to cross: Virtually no one is making content in that rich of a resolution yet, and the televisions themselves often cost $10,000 or more. The “not enough content” problem has yet to be fixed, but Chinese television manufacturer Seiki has shattered a major price barrier with its new SE50UY04 model. It’s a 50-inch, 4K UltraHD resolution television offered for just $965 – cheaper than many standard HD televisions currently on the market. Televisions with 4K level resolution measure 2,160 pixels high by 3,840 pixels long. This works out to about four times better resolution than 1080p HD televisions currently available. No major networks or cable providers offer 4K content yet, though testing needed to broadcast the 2014 FIFA World Cup in 4K is underway. 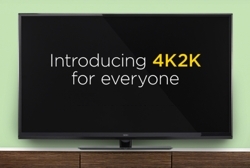 The biggest problem with this 4K TV is out of the manufacturers’ hands, though: There’s virtually no 4K content currently available to watch on your shiny new TV. You’re probably better off saving your cash for an even cheaper model a few years from now when Ultra HD content is more widespread. Of course, if you really want to be the first on your block to own a 4K TV (or if you want to use this television as an oversize computer monitor), you’ll be hard pressed to find another television that even comes close to the Seiki SE50UY04 in terms of price. It is currently available for purchase on Amazon.com for $965.99 with free shipping. It’s still 2013 in New York, and the SE50UY04 is now only $769.98 (same link as provided in article). If I can get a 50” television for less than my monthly power bill, I’m going to pull the trigger no matter how dinky its remote is. By the way, there is a service menu where you can bullseye the color temps—you just have to know the code.